The ships offer the benefits below. Lower-grade ships offer some but not all of them. With Antarctica cruise Zodiac landings, you are virtually guaranteed to see exciting wildlife in their natural habitat - and observe raw natural beauty of awesome icebergs, sweeping glaciers, and towering peaks. To me, it was like being on a distant planet. What makes luxury Antarctica cruise ships special is you experience this remote natural spectacle on the most comfortable, refined, and well-appointed Antarctica cruise ships that offer Zodiac landings. The decor and ambiance are cozy. The service and food are commendable – and onboard activities are geared for intelligent travelers. Large cruise ships do not conduct Zodiac excursions. They are look-but-don't-touch cruises. On luxury and other smaller cruise ships, you enjoy two Zodiac adventures a day. Read my two Zodiac landing web pages for details. 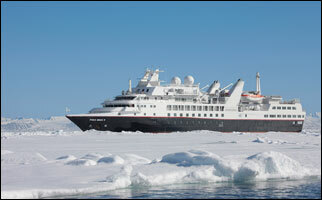 Luxury Antarctica cruise ships have the finest all-around lecture teams among Antarctica ships. Read my Onboard enrichment web page for details. Luxury Antarctica cruise ships have two or more restaurants and lounges, quality theatre, and more. On these and other small ships, you relish up close wildlife, seascape, and landscape viewing from the deck. Lecturers stand next to you, eagerly providing insights. No Antarctica cruise ship crew tries harder to pamper its guests - and to anticipate their needs - as much as the crews on Antarctica luxury cruise ships.